The losers under this injustice system are the young people I know and love. Columbia, South Carolina just fired the CAPTAIN of the Fire Department after he posted online that he was considering running over some Black Lives Matter activists if he saw them. — Shaun King, America. 2016. We need a special prosecutor, now. And a prosecutor who can look at these cases of police brutality or police wrongdoing and make real judgments and decide whether people should go to trial. For now, let’s focus on what we already know — deep in our hearts. We know there is something wrong with our country. There is too much violence, too much hate, too much senseless killing, too many people dead who shouldn’t be. And we know there is clear evidence that African Americans are much more likely to be killed in police incidents than any other group of Americans. What it means is that we are all sick and tired of seeing unarmed people shot by police officers, That young people in African-American communities are harassed by police officers, where police departments are not there to be supportive but are in many cases oppressive, and that’s an issue that has to be addressed. Black men are 25% of Baton Rogue population but 100% of those killed by Baton Rogue police. When people say ‘Black Lives Matter, that doesn’t mean blue lives don’t matter. It seems that it's either pro-cop and anti-black or pro-black and anti-cop, when, in reality, you can be pro-cop and pro-black, which is what we should all be. It is what we should be aiming for. ...you can truly grieve for every officer who has been lost in the line of duty in this country and still be troubled by cases of police overreach. Those two ideas are not mutually exclusive. You can have great regard for law enforcement and still want them to be held to high standards. If the only time you have a public opinion on civil violence in this country is when police face harm or sadly, death, then you come across as disingenuous, your intentions, suspicious, and your perspective, riddled with bias and prejudice. Empathy is not a limited resource. Taking on systemic racism—and rebuilding trust between police and citizens—will require contributions from us all. I don’t know where we go from here because those of us who recognize the injustice are not the problem. Law enforcement, militarized and indifferent to black lives, is the problem. They were the interchangeable faces of violence and politics. Police abuse in black and brown communities is generations old. It is nothing new. It has become more visible to mainstream America largely because of the proliferation of personal recording devices, cellphone cameras, video recorders — they're everywhere. We need police officers. We also need them to be held accountable to the communities they serve. A system cannot fail those it was never built to protect. Because this? This is not justice, or peace, or progress. It reeks of death, the stench of corrupt power wielders, it reeks of silence, of institutionalized murder, of heartbreak, of irreparable damages; this feels like waterboarding, like syndicated torture for the masses. I want you to know the 24-hour news cycle moves on — I won’t. This is so important to who we are, what kind of nation we are making for our children and our grandchildren. As President Obama said yesterday, and as we all know in our hearts to be true: We are better than this. And if we push hard enough, and long enough, we can bend the arc of history toward justice. The system’s failure to catch killers effectively made black lives cheap. 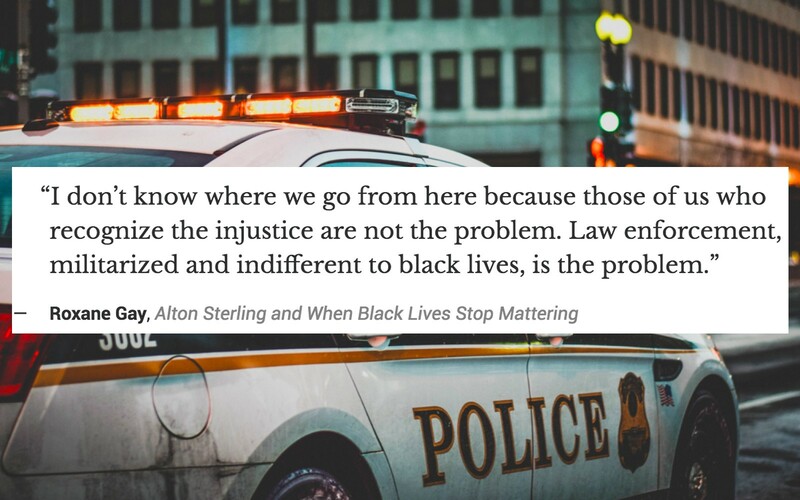 #AltonSterling was the 154th black person killed by police this year (to date).